It's fascinating, delicate and sweet. It doesn't tie everything in a bow for you at the end, but that doesn't mean it's not lovely. 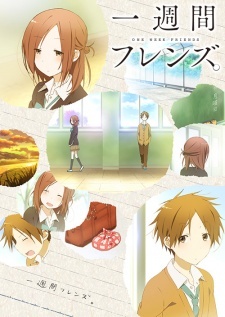 It's about a schoolgirl with amnesia (Kaori Fujimiya) and it doesn't end with all her memories restored. Not even close. She's on a slow path to improvement. That's it. The other main character is a boy she gets very close to (Yuuki Hase), but the series doesn't end with their relationship having moved to a romantic level, even though Yuuki would clearly love that to happen. They're just friends, but that couldn't be a bigger deal for either of them. You see, Kaori's spent a decade keeping herself friendless and rejecting anyone who tries to get close to her, despite being naturally a warm, kind girl who used to love having friends. She's got a memory reset. Every Monday, she's had a brainwipe. Most of her memories will be retained, fortunately, so in most respects she's a functioning human being. She can walk, talk and speak Japanese. She's actually very good academically, partly because all she does at home is go home and study. No, the memories she loses are those of friends. Anyone she sees as a friend will have been erased from her brain, along with anything enjoyable she did with them. If you want to be her friend, you'll have to start again from scratch every Monday. Hence the show's title. She remembers non-friends, so you'll be fine if you've been cold and rude towards her. She also remembers her family, fortunately. However at the start of the series it's the devil's own job trying to make Kaori unbend and open up towards anyone. Talk to her and she'll ask you to stop and leave her alone. Go on to the roof where she's eating and she'll get up and walk away. She's painfully aware that her memory wipe is going to look like a slap in the face when Monday comes around and it hasn't even occurred to her to try to explain about her condition to anyone. Most people wouldn't believe her. It is pretty unlikely-sounding, after all. I like many things about this show, but one crucial thing about it is its intelligence. It both subverts and thinks hard about its own rules. It takes Yuuki almost no time to suggest that Kaori start keeping a diary, for instance, which becomes a proxy memory and lets Kaori catch up on all the stuff she's forgotten. It occurred to me that becoming family (i.e. getting married) might be a way of breaking the amnesia... and then late in the series, the show's ditziest character points this out in dialogue, albeit only as a semi-frivolous throwaway. On the other hand, though, you can't rules-lawyer this show. Question: what would happen if Kaori had a conversation with a friend and a non-friend? Answer: it's fuzzy. She'll remember something involving the non-friend, but the details will be too vague to allow questions like "who was the other person we were talking to?" Similarly, I was barking up the wrong tree by wondering whether Yuuki was necessarily doing the right thing by trying to be her friend in the first place. She's saying no. Maybe she doesn't want great chunks of her memory erased every week? What if saying hello to her in class were to start wiping her memories of school itself? She'd no longer be able to learn and study, in the long run handicapping her even more in life. I still don't think this is a trivial question, but the show's answer to it is to point out that Kaori's a person, not a mathematical problem. She herself wants friends. End of discussion. She just thought that was something she couldn't have. The way forward isn't to accept the rules of her amnesia, but to persist and help her heal herself. Her condition is trauma-induced, after all, rather than brain damage or anything congenital. Over time, we see her getting very slightly better. Little things will pop back unbidden, faces start feeling familiar and what she reads in her diary every Monday starts ringing a few, faint bells. Kaori's lovely. Yuuki is too, essentially, but it's possible to have quite a complicated disussion about him. Some people who've watched this anime dislike him and it's certainly true that he's capable of being jealous, possessive and borderline creepy. For a while, it's almost as if he sees Kaori as his property. When Kaori makes her first new friend who's not him, he's not happy. All that said, there are three reasons why I like him anyway. (a) He always puts Kaori first. He never, ever tries to push beyond the friendship level that's best for her. He's genuinely trying to help her, even when his judgement leads him to wrong conclusions, and he never lets himself be led by that jealousy. You can't question his kindness or his good intentions. (b) He's a teenager in an intense relationship with a girl he fancies. For a long time, it's just the two of them. Kaori even orders him to keep it secret so that no one else knows about them. It would almost be more surprising if something like that hadn't come up, especially since Yuuki is a fairly quiet person himself. He's not without friends, but he's no party animal. (c) This is the important one: he grows. Yuuki develops as a person over the course of the series, just as Kaori does. His less attractive tendencies make Kaori blow up at him in ep.4 and over time he clearly manages to sort himself out. His error in the last couple of episodes (eventually rectified, thank goodness) is the exact opposite of that former jealous possessiveness. He's outgrown it. The existence of her other friends is a comfort for him. He's matured, albeit into someone who can make new mistakes instead. I like the supporting cast too. Shougo Kiryuu is interesting, being a reluctant friend who regards everything and everyone as a pain in the neck and will say so to your face. He's not actually without compassion, but you'd need a coach and horses to drag it out of him. (Kaori always remembers Shougo.) Saki Yamagishi, on the other hand, is a thematic mirror of Kaori but with a completely different attitude to life. (She even gets a distant but clear parallel to the Kaori-Yuuki relationship.) Saki also has memory problems, but not because of trauma or psychological damage. She's just dozy. She's also awesomely laid back about being a hopeless case and drifts her way invincibly through life, protected in all things by her optimism, her cheerfulness and by generally not giving a damn. I loved Rumi Okubo's performance as Saki's voice actress, by the way. There's self-awareness and a sense of humour about her scatterbrained laziness. It's distinctive. "Hehehe." Apparently there's a Hollywood film with a not dissimilar premise, 50 First Dates. It stars Adam Sandler and Drew Barrymore, but the reviews I've just skimmed are all very positive. I've never seen it though, personally, and I'm not expecting to prefer it to One Week Friends. Most of this series has no plot, as such. There's some more overt drama in the final episodes, but for the most part we're just exploring the characters, their situation and their evolving relationship. It's funny and sweet. Kaori's understanding mum made me laugh, for instance. The show's sharp edges stop it from being saccharine (Yuuki's issues, Shougo's coldness and most importantly Kaori's amnesia), but it's basically a charming show that made me like its characters and want them to find happiness. It's delicate. It's another winner from Brain's Base.